Hey congratulations! Your dream of destination is going to be true! Undoubtedly, destination wedding is analogous to the thrill and romance in some other land and saying your wedding vows. We know how it feels when your dream come true, how one is in cloud nine and same is the case with you too. That’s great! Once you’ve got your final wedding dates, the very next step is to figure out where ‘The Location’ of the destination wedding has to be finalized. A wedding away from home on the other land more often than not, sounds great. Although there are so many things to be considered before one decides to get wed-locked in some other land. And if you have chosen some foreign land for your destination weddings than the challenges of wedding planning go a little higher. Weddings in other lands are already intimate in nature and if it is an International affair than it becomes super intimate ceremony. Hosting a wedding in some foreign land of your dream, downright away from home, amidst beautiful scenic views with few close near and dears, the thought itself is so mesmerizing. However, reality check: Wedding in other land has its pluses and minuses, from tacking thousand miles away to language barriers, logistics to vendors, rules and regulations of other country, etc., but you worry not! Here we are putting together the comprehensive checklist for your destination wedding, which you can refer anytime for your destination wedding related requirements. Here is an ultimate destination wedding checklist, regardless of where in the world you two get hitched. 85 Tips for your destination wedding! Stay abreast…. 1. 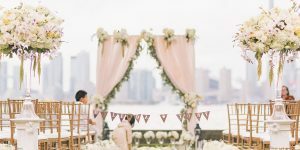 Finalize your destination wedding budget: Wedding is a pricey affair we all know that and when it is happening in some other land than automatically wedding expenses shoot up, that is understood. The first and foremost step upon having final wedding dates in hand is to work out on the wedding budget. This is most crucial part of your wedding planning, irrespective of the place where you get hitched. Your wedding budget will include most of the typical wedding items from venue to décor, wedding photographer to wedding outfit, so on and so forth. What additional you have to see here is the travel expenses like airfare and accommodations. Plan your destination budget!! 2. Prepare your guest list: Your destination wedding budget will be analogous to your guest list. How you ask…….. Your budget will go high with every guest you increase in your wedding guest list. Deciding a guest list is the most harrowing job in any wedding. Although, destination weddings are very intimate ceremonies, yet there are people in life who you cannot just ignore. Your father may have some of his close friends he may wanted to invite and likewise, but because of budget constraint you have to chuck out many names. Here is a quick tip while you prepare your wedding guest list sit with your parents, your spouse to-be and his/her family when you draft your wedding list. 3. 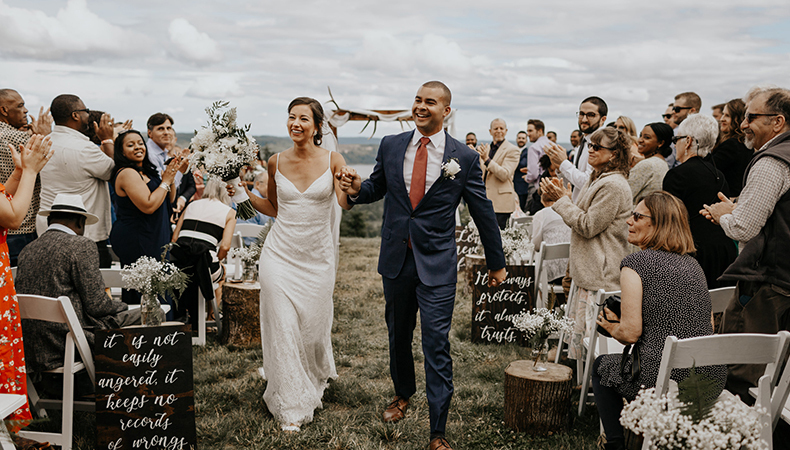 Choose a country or region you’d like to get hitched in: Next very important step of your wedding planning is to decide on the country or region you two would want to get hitched in. 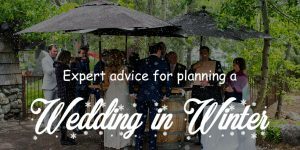 Make sure that you check every aspect of the region like which season is good to get wed-locked there, how are the weather condition of the place. After all, what is more important is your and your guests comfort and ease in other land. Check it well!! 4. Your passports and travel visas: This is very, really very important before you plan your wedding journey to see that your spouse to-be and other family member do have their passports. Because not every country let you in with permit. Make sure that you have your passports and travel visas, if not then start the application process ASAP, before your dream of wedding in International location get shattered. Also, check the validity of your passport because some countries require that it be valid for a minimum of 6 months prior to the ceremony. Additionally, it can take months to process! 5. Know about marriage license options: Wedding requirements vary from country to country, and region to region. They range anywhere from blood tests and waiting periods to extra fees. So, if you are determined to get married in that particular location, better you find out what are the marriage license requirements of the country you have chosen for getting hitched in. Go through their website, also you can know through a wedding planner (if you hire one). 6. Hire a professional: This may look an additional expense to you, but believe you me hiring a professional will not only help you in managing your wedding impeccably but also the pain which you will go through otherwise will be reduced to minimum. Hence, it is advisable that you hire a wedding planner for your destination wedding. He/she will help you in managing the processes and lot more. 7. Scour wedding venues: Great that you have decided on the country and budget. Now is the time to scour wedding venues for you wedding. Start scouring it online, also you can take help of your wedding planner or the travel agency which you will hire for your travel and accommodation (these people have fair idea about the places and prices, sometimes they can negotiate with them). If you find a venue which is good to go, contact them, get all the details, and contracts in writing and send in an initial deposit if needed. If at all possible, you can plan your pre-wedding shoot there, but that’s not possible in everybody’s case. So, you can get inputs from your wedding planner, he may be a great help to you! 8. Hire a travel agent/agency: Once you have your destination location for your wedding, the very next step is to meet a travel agent or any agency that specializes in destination weddings (there are many you can find out online), these travel agents can match you up with a location befitting your vision. They have a knack for that, not only this but also they can negotiate with venues to get you the best pricing, perks, and other upgrades! 9. Book your honeymoon suite: If you are considering the same venue for extending your honeymoon also then it is advised that you book your honeymoon suit as well along with the booking of your venue. Enjoy your extended holidays there with your better-half!! 10.Wedding insurance: Also, needed to be checked while you are planning for your wedding in a land afar from your home. Also, don’t forget to consider other options like cancellation insurance. 11. Send out wedding invites: It may sound too early to you but this is imperative in case of destination wedding! Make sure that you send invites early, this way your guests will have ample of time plan for you wedding in advance. They will also have so many things to consider before they finally decide to make for your wedding. Send them save your date, to really help them save their dates! 12. Decide your bridal party: It’s important, see who would be your bridesmaid and how many you would want for that matter, think over it and see choose all your buddies who you think should accompany you in your big day. Also, making sure they all have passports or any other identification needed to travel. 13. Book your accommodation: Once you know how many guests including your bridal party will gather, now is the time to book accommodation for all of them including you and your family. You can do it online, research all nearby hotels of your wedding venue, check prices with them, get the details and book the hotel well in advance. Also, let your guests know where they are going to stay for your wedding. 14. How about creating a wedding website: Yes, you can also create a wedding website which will include all the details related to your destination wedding like travel and accommodations, predicted weather conditions, airport information, registry details, and local maps, so that your guests will have enough information beforehand and likewise they would know what to pack and what not. 15. Be an early bird, purchase your air tickets: Oh everything done and you missed to book your air tickets (nightmare), this is important. Book yours and your families’ air ticket well in advance, get those early bird discounts. There is no point to wait for the last moment, you know airfare shoots. 16. Book your vendors: You can’t hire your vendors locally otherwise you will end up bearing their hotel and travel expenses. It’s better that you sit with your wedding planner or venue coordinator to finalize the vendors. Make sure that you meet and interview them online maybe over skype, it is a must before you book them. 17. Plan for other ceremonies as well: Your wedding is once in a lifetime event, you can’t leave any stone unturned. Since destination weddings are longer celebrations, everyone needs to travel from afar places. Plan your other events like welcome party, mehndi, sangeet, and other wedding events too beforehand. Make sure that you include all the dates in detail in your wedding invites so that your guets’ also know which all functions are there. 18. Wedding gifts for your guests: Your guests’ are already spending huge amount to be part of your big day. You also make sure that they equally feel the same. Decide for your guests’ wedding gifts wisely which will give them assurance that it was worth attending your wedding. It’s not about the gift it’s about the feelings and emotions. 19. Your wedding outfit: Start scouring your wedding outfit now. There is not good time than this for that. You may wait for the last minute just to make things chaotic, it is better that you start shopping for your wedding outfit. You will surely not get your desired dress in one go. Considering your wedding location and other events, the weather conditions, start searching for your wedding outfit. Visit stores, as this will also take good time from your schedule. And definitely you would never want to look ordinary on your wedding at least. Search online pinterest and other designers for that, see what style you like the most and accordingly you can find out wedding outfit for your wedding. Make sure your dress is packed only after checking fittings and all, also, your wedding outfit should be packed accordingly as it has to be taken to different country trough air. 20. Get Engaged: Yes, now it is the time when you two can decide to get engaged along with the engagement photo shoot. If your wedding photographer is same for all the events than you it will be in your photography package or else you will have to book separate photographer for your engagement photo shoot. Let the world know that you two are engaged now and soon-to-be married. 21. Create your menu list: Since, yours is a destination wedding and you will never be able to taste anything until you reach there. Work with your wedding caterer and create the wedding menu beforehand. 23. Set dates and locations for bachelor/bachelorette parties: Bachelor/bachelorette parties you can organize locally also if you want it that way. You can create a guest list for your bachelor party and send them all invites for them. Book a desired location to throw your bachelor party. This is quite essential before you finally leave for your wedding to another country, let you and your friend’s have the flavor of your final days as bachelor. 24. Book your wedding transportation: If your wedding venue and your hotel is at a separate location, make sure that you book appropriate transportation for yourselves and your guests. SO as to avoid any kind of last minute chaos at the wedding. Setting up a shuttle service for guest transportation to and from the wedding is a great idea. Let your guests’ have all the comfort. 25. Check your dress fitting: Since you have ordered the desired dress already, now is the time to check the fitting of the dress, to see if everything is okay because later it will be late. Schedule your dress fitting and get your reception party outfit also ready. 26. Order your wedding reception invitations: Since it is impossible for you to invite all your guests at your wedding function, it will cost you really very high. Still, you’ll have so many people who you would want to have in your life’s biggest celebration. For all of them you can organize a reception party in your home town, so that they don’t feel left out at all. You can plan your wedding reception either before leaving for your wedding or after coming back from your honeymoon. So, that people who couldn’t be invited can attend your reception. Destination weddings are already close-knit weddings. Get your reception invitation cards and send them out to people you care for. It is very important that before booking your vendors you review contracts and get everything in writing. Everything means everything. You can make a separate folder for filing all the wedding related docs in there, like contracts, bills etc. Now this is crucial period of your wedding planning journey as only few months left for that. 28. Start planning fun activities: These days no wedding go without adding a fun element to it and yours is a destination wedding, how is that possible that it goes without fun. Start planning fun and recreational activities for your wedding to make it downright playful to cherish forever. Already you will have enough time there, it is good that you and your guests’ are engaged in activities which make up your mood and create happiness in and out the atmosphere. Sit with your wedding planner and accordingly decide few games for your wedding. To have unlimited fun. 29. Go Shopping: Now almost all the things are done, it’s time to enjoy shopping (girls’ thing you know). There are many things which you will need after you wedding in your new house. Purchase outfits for your honeymoon, lingerie, night wares, wedding shoes, outfits for other functions, outfits otherwise and essential. Make sure that you don’t over spend money. Buy only what is needed. 30. Shop for bride/groom and in-laws: Shop gifts, dresses for your in-laws and bride/groom. This you can do together also, so that tomorrow there is no complaint from anyone. Weddings are delicate affairs sometimes, especially when it’s about gifts. 32. Your beauty regime: Don’t forget to have a planned beauty regime for your final day. Amidst all the preparation you may get tired and exhausted, and off course you will never want to look tired in your wedding pictures too. Book a parlor or salon beforehand, get your facials and massages time to time. Give yourself plenty of time for your beauty regime. It matters! 33. Prepare for your wedding shoot: Decide your favorite location for your pre-wedding shoot along with the attire, outfits, props and places etc., for your shoot. It is important that you consider a place which very well relates to your love story or display your personalities and your relationship. 34. 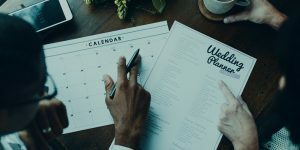 Plan your pre-wedding photo shoot: When all the major preparations are done, your wedding planner is already efficient enough to take care of everything. It’s time to relax a bit and have your pre-wedding shoot with your love. Albeit, your pre-wedding shoot is not mandatory but it is a nice way to spend some good and WE time with your spouse to-be. Amidst all the preparations, your work life it really becomes tough to get time to spend with your love, so this is a wonderful way to do so. Get, set and go for the shoot. Have a great photo shoot to cherish for generations. 35. Your flight and hotel bookings. 36. Guest RSVPs and meal choices. 38. Proffered shot list with your photographer/videographer. 39. Menu, beverage, and catering details with the caterer. 40. All rental delivery times and pickups. 41. List of songs for all the ceremonies, like cocktail party, main wedding and reception with your DJ and/or band/musicians. 42. Check and get any required vaccination before traveling to your destination. 43. Check that you have all the necessary legal documents in hand. Including your passports, birth certificates, visas, and anything else needed to make your destination wedding legitimate. 44. Check and confirm wedding transportation services. 45. Organize welcome bags for your wedding guests, which includes a welcome note, wedding itinerary, maps, some treats, function details or travel-sized essentials. 46. Ship things which you can’t take along: This is the time when you need to start sending things which you cannot carry along with you. Send it your on-site wedding coordinator, anything from welcome bags to wedding decors. Ensure you use a trusted and timely shipping method for sending your items and get your package (s) insured for that matter. 47. Pick up from the store: If anything is remained to be picked you should pick it now, like your ornaments from the jeweler, your wedding rings and check all everything in detail. 48. 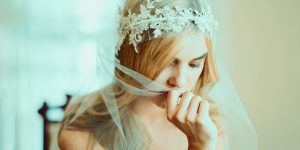 Organize your wedding accessories in one place: Your wedding is in some other location chances are you might have never gone there before so it is crucial that you organize everything in one place. It’s you day and it is important that all your things are organized correctly and in place so that there is no problem tomorrow. Check all the things are there from your outfit to wedding shoes, undergarments to other accessories. 49. Put a packing list together: Since you have only few weeks left, make sure that you put a packing list together so that no item (s) is overlooked finally. 50. One last time check if everything you needed is there, cross check everything. 51. Pick up your dresses (if any for stitching or alteration). 52. Confirm your flight numbers. 53. Confirm arrival times for all the vendors and other key players in your wedding. 54. Finalize the set –up, the seating arrangements (if specific). Also, have a seating chart or plac cards created in advance. 55. Check your bridal emergency kit: Make sure that you have your emergency kit ready and don’t forget to pack it with your bags. 56. One final check of weather conditions: Check out the weather report of your location, see everything is fine and if not, then contact your venue staff to make sure a contingency plan is in place. 57. Time to start packing for your wedding and honeymoon: Now the festive season starts hereon, give yourself enough time to pack for your wedding and honeymoon. Have a check list handy while you pack your luggage so as to make sure that everything is in place. And no harm in checking twice or thrice if everything is in place. 58. Pack electrical converters too: Don’t forget to carry your electrical converters along with you luggage, most useful in case of exigencies. At least you can plug in your device when gone out of charge. Or anything else needs to be used likewise. 59. Keep your folder or binder handy: Don’t forget to carry your folder/binder along with you as it will be a help while you will make the final payments to your vendors there. Also, figure out the tips and other small expenses. Also, make sure that you collect all the required information of tipping customs of your wedding location as tipping vary greatly from country to country, better you ask your wedding coordinator about proper tipping etiquettes. 60. Set-up a meeting with you vendors and coordinators: Make sure that you set-up a meeting with your vendors and coordinators in advance. All you need to do is inform them your arrival date and accordingly fix up a meeting with them when you are there. It is essential that you meet your vendors and coordinators in person to have more clarity on things. Fix up a meeting date with all of them. 61. Final facial or massage: Get your final facial or massage done before you leave for your wedding to different location. As facials do take time to glow. 62. Check your wedding attire, wedding shoes and other accessories and everything you need for your wedding is packed properly. 63. Ready! Get, set, and go on the airplane! 64. Arrival at your wedding destination: You should arrive your destination wedding at least 4 – 5 days before your actual wedding to see whether things are in place or not. Also, you have to be there to greet your guests’ too. 65. Visit the wedding venue: Since you have reached your wedding location, now you have time to visit your wedding location and have a detailed check there. 66. Meet with you vendors and coordinators: Since your meeting with vendors and coordinators was already fixed it’s time to meet them in person and understand things closely and if anything which you want to add on you can tell. 67. Apply for your wedding license now. 68. Have a menu tasting session with your caterer. 69. Get guests’ welcome bags delivered to their respective rooms. 70. Welcome your guests’ as they have started to arrive. 71. It is the time for your fun activities and games which you planned for you wedding. Engage everyone present out there and have loads of fun with all of them, you will never get this chance again. 72. Enjoy cocktail party with all of them, drink, dance and have loads of fun. 73. Get your makeup & hair trials done in these days. 75. Get your wedding dress steamed just to remove any travel-induced wrinkles. 76. Enjoy your sangeet and mehndi night. 77. Go to bed early, as tomorrow is the D-day and you need to have your beauty sleep tonight! 78. Enjoy your haldi ceremony in the morning. 79. Allow yourself plenty of time to get ready. Don’t just hurry. 80. Get ready: Have a separate room or place for getting ready where only you and your make-up artist is along with bridesmaid to see if something is needed. 81. Don’t forget to carry your marriage license to the ceremony. 82. Take a deep breath! Enjoy yourself, even if something doesn’t go as per your plan just ignore it. You and your spouse to-be are important at this point and nothing else matters. Just focus on your wedding and on the celebration. Remember, this is the day you have been waiting for and preparing for past one year and half. Enjoy every bit of it. 83. No need to get nervous or anxious, everything is good. Just step ahead and say your wedding vows and step in your new life, new beginning. Look beautiful, it will reflect in your wedding pictures which you will cherish forever your lifetime. 84. Be yourself, cool and relaxed! 85. Last but not the least, have loads of fun at your wedding!